Ms. 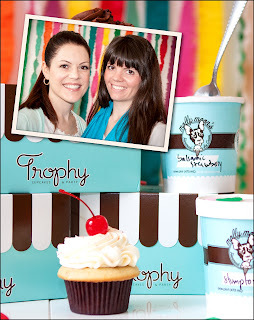 Moon and Jennifer Shea of Trophy Cupcakes and Party have announced a new courtship that is sure to make holiday festivities and party planning more fun for everyone! A sweet partnership that has been in the works for nearly a year, Neitzel and Shea couldn’t be more thrilled to pair their creative and beautifully-crafted treats that have been sited locally and nationally as the most delicious! The pair selected 13 celebratory occasions, starting with Mother’s Day weekend 2012, in which four-packs of Trophy’s seasonally delectable cupcakes, all dressed-up in cute white and brown striped boxes, will be available for purchase and pre-ordered pick-up at Molly Moon’s scoop shops located in Seattle’s Wallingford, Capitol Hill, Madrona, and Queen Anne neighborhoods! Need another reason to celebrate? Guests who book a party in Trophy’s adorable party room now will have the option of adding Molly Moon’s deliciously creamy ice cream to their party menu. Also, beginning May 12, those who schedule a cupcake delivery via Trophy’s Trophy Mobile can add Molly Moon’s pints to their order. This exclusive partnership is the only way to have Seattle’s favorite cupcakes and ice cream delivered. Let’s party! Exciting! I cannot tell you how many times we've had to visit both stores in Wallingford to get our full fix. I'm totally guilty of double dipping while in Wallingford as well.